A man living in Kent, in the South of England, has been arrested by police for posting a picture of a burning poppy, sparking an intense backlash from many concerned about the erosion of free speech. Police in Kent have not made it clear whether the man actually took the picture himself, or if it was a picture found somewhere else online. 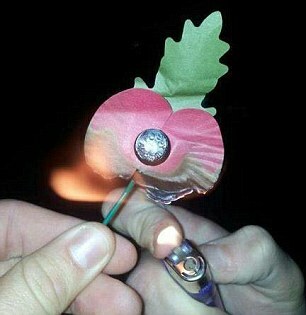 The image shows a paper poppy, the kind that are sold by The Royal British Legion to commemorate remembrance day in Britain, being set on fire with a lighter. The suspect is 19-year-old Linford House, who was arrested yesterday on suspicion of ‘malicious telecommunications’ after police were contacted. He is said to have written a derogatory comment with the Twitter post. Reactions to the arrest have gone viral on Facebook and Twitter, with many suggesting that the arrest contravenes human rights laws. Twitter use @thisisrjg, tweeted: ”We do not have a right to not be offended. We certainly don’t have a right to lock up someone for offending some people”. “Kent Police need to urgently release this man and drop an utterly ridiculous investigation into something that has harmed no-one.” Nick Pickles, director of advocacy group Big Brother Watch, told the London Telegraph. “It is not illegal to offend people and, however idiotic or insensitive the picture may have been, it is certainly not worthy of arrest. This case highlights the urgent need to reform a law that poses a serious risk to freedom of speech after several ludicrous prosecutions in recent months.” Pickles added. “You don’t have to support this man’s views to support his right to be able to express them.” she added. London Guardian blogger, Ally Fogg, notes that the police action in this incident represents “the latest step towards a new totalitarianism”. “It is now clear that a new criminal code has been imposed upon us without announcement or debate. It is now a crime to be offensive. We are not sleepwalking into a new totalitarianism – we have woken up to find ourselves tangled in its sheets.” Fogg writes. “The new tyrant is not an oligarch or a chief of secret police, but an amorphous, self-righteous tide of populist opinion that demands conformity to a strict set of moral values. What we are seeing has less to do with the iron heel than with the pitchfork.” he adds. Although it is not clear that the man currently in police custody was indulging in any sort of protest, there are many people in Britain who have spoken out against the pomp and ceremony of remembrance day, and especially the use of the poppy as a symbol of commemoration. Last year award winning London Independent journalist Robert Fisk penned a remarkable piece, arguing that those who flaunt the poppy symbol on their lapels may as well be openly mocking the war dead.